Saint Paphnutius of Borov was born in 1394 in the village of Kudinovo, not far from Borov, and at Baptism he was named Parthenius. His father John was the son of a baptized Tatar, a “baskak” (“tax-collector”) named Martin, and his mother was named Photina. At the age of twenty, Parthenius left his home and received monastic tonsure in 1414 with the name Paphnutius at the Vyosky-Protection Monastery near Borov under its abbot, Marcellus. Saint Paphnutius struggled for many years at the monastery, and when Igumen Marcellus died, the brethren chose him as his successor. Saint Photius, Metropolitan of Kiev (July 2), ordained him to the priesthood around the year 1426. The monk spent thirty years at the Protection Monastery, where he was igumen, Elder, and Father-confessor. At fifty-one years of age he fell grievously ill, gave up his position as igumen and was tonsured into the Great Schema. After recovering his health on April 23, 1444 (the Feast of the holy Great Martyr George the Victory-Bearer), he left the monastery and settled with one monk on the left bank of the River Protva, where it meets the River Isterma. Soon brethren began to gather to him at this new place, and the number of the monks quickly grew. A new stone church was built in place of the former wooden one, in honor of the Nativity of the Most Holy Theotokos. The finest iconographers of those times, Dionysius, Metrophanes, and their assistants were invited to adorn the church with icons and frescoes. Saint Paphnutius was an example to the brethren, leading a strict life. His cell was the poorest of all, and he chose the worst morsels of food. On Mondays and Fridays he ate nothing at all, and on Wednesdays he only ate dry food. He did the most difficult tasks himself. He chopped and carried fire wood, dug and cultivated the garden, yet he was always the first to arrive for church services. Saint Paphnutius earned the deep respect and love not only of the brethren of his own monastery, but also of other monasteries. Through the providence of God a twenty-year-old youth, John Sanin was guided to the monastery. After testing him for a time, Paphnutius tonsured him into monasticism with the name Joseph. Later on Saint Joseph of Volokolamsk (Sept. 9) defended the purity of the Orthodox Faith and entered into struggle against the heresy of the Judaizers, condemned at the Council of 1504. Saint Paphnutius blessed the young man in his endeavors. A week before his death, the saint foretold his end. After he had prayed and blessed the brethren, he fell asleep in the Lord on May 1, 1477. 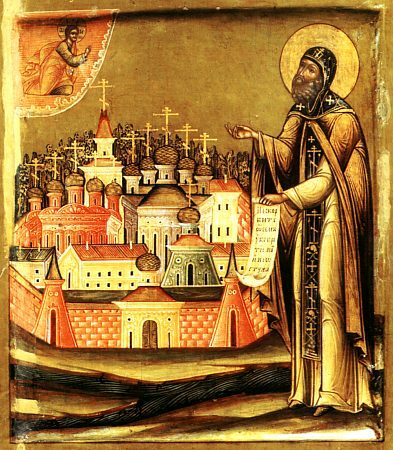 Saint Paphnutius was a disciple of Saint Sergius of Radonezh (Sept. 25). Жития светлостию просветив твое отечество,/ в молитвах и постех дарований Божественнаго Духа исполнился еси,/ и, во временней сей жизни добре подвизався,/ милость благоутробия всем скорбящим отверзл еси,/ и нищим был еси заступник./ Тем молим тя, отче Пафнутие,/ моли Христа Бога, да спасет души наша. Божиим светолитием просвещен, отче,/ постническое стяжал еси жительство, преподобне,/ иноком предобрый наставниче и постником благое украшение./ Сего ради Господь, труды, твоя видев,/ чудес даром обогати тя,/ источавши бо исцеления./ Мы же, радующеся, вопием ти:/ радуйся, отче Пафнутие.